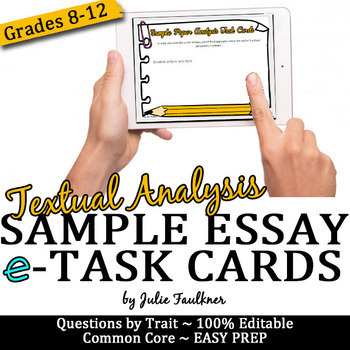 These Sample Essay Analysis Task Cards are an excellent modern and engaging activity to have students show their understanding of writing, take ownership of their learning, dig deeper, and closely analyze model papers -- all virtually via Google Drive. You can use these cards to have students respond to model essays or student writing. - Questions that correlate directly with not only CCSS writing anchor standards, but also with higher-level thinking analysis skills. You can have these ready and send them out a moment's notice to conduct an amazingly in-depth lesson. Your students will love that they are interactive and virtual. You will love that your students are thinking critically and meeting standards. Your admin will love that students are engaged and that you've differentiated your lesson! ♥ "Thank you so much for this lesson! This is exactly what I've been looking for! Excellent work and a steal at this price! Thanks!" 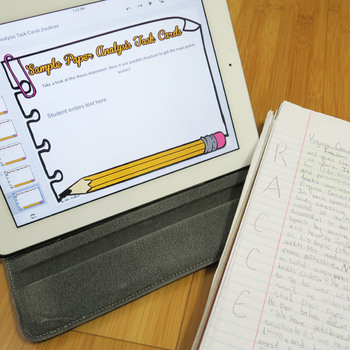 ♥ "Student evaluation truly makes students better writers, thanks!" 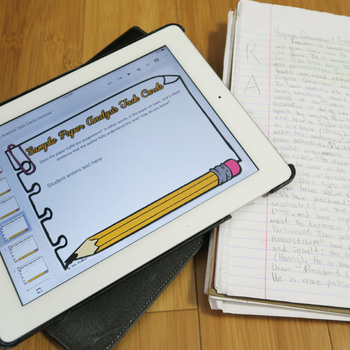 ♥ "Great for evaluating a published author or for evaluating a peer's writing. I intend to use in a writing center." ♥ "I LOVE these task cards! It turns the conversation away from me and getting few responses to the kids and getting everyone to respond! They work in smaller groups and are on task, leading their own discussions! A teacher's dream!" Free video at my Facebook page on using task cards in station rotation. Free video tutorial on a method for analyzing model papers. Free story on my Instagram setting up task cards in station rotation. This resource is included in my Writing Curriculum.